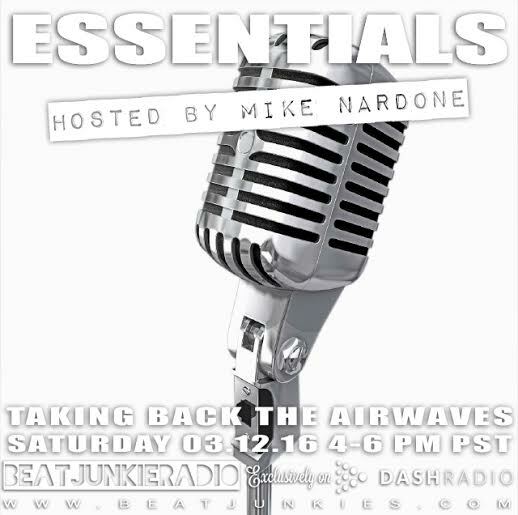 It is an honor to have the legendary LA Hip Hop Radio personality, Mike Nardone return to the airwaves on Beat Junkie Radio. He returns to his roots by debuting his new show called “Essentials” on Beat Junkie Radio. If you’re not familiar with Mike Nardone, he was the first person to start up a college Hip Hop radio show in 1987 at KXLU (Loyola Marymount) in Los Angeles called “We Came From Beyond” as well as having a show on the defunct 92.3 The Beat called “Da Joint” with King Emz. Mike is the West Coast counterpart of the legendary NY Radio Duo, Stretch Armstrong & Bobbito Garcia. This particular audio is from Mike’s 2nd show (June 11th); Our very own Babu & Rhettmatic are Mike’s assistants.